Exciting New Guest Chapters Added to Reinventing The Tattoo! 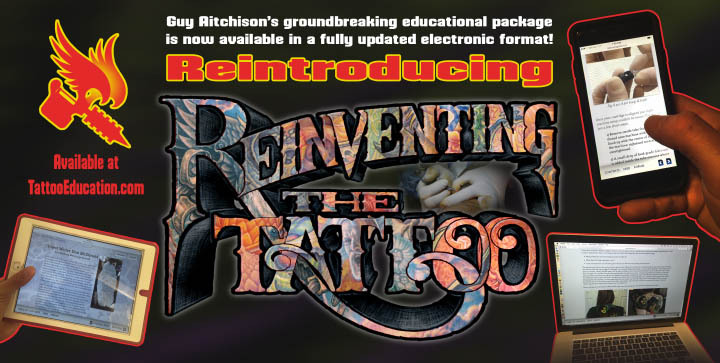 The release of the electronic edition of my educational package Reinventing The Tattoo has given me a chance to go back over the entire thing and reassess not only where the curriculum needed to be brought up to date, such as with the Photoshop and tattoo machine chapters, but also where it needed to address the ever expanding spectrum of artistic styles and techniques being used in tattooing. That's why I'm so jazzed about the first round of guest writers that have contributed to the book; this includes Russ Abbott, whose approach bridges the classic to the contemporary; Nick Baxter, whose understanding of classic realist painting techniques is mirrored in his layering methods on skin; Don McDonald, who does so much large-scale sleeve and bodywork that he's perfected ways to get stencils down for epic projects in one shot; and Megan Jean Morris, whose fine art sensibilities carry across into the way where she works with her clients to create the best possible project for both artist and collector. The Reinventing The Tattoo electronic format is made for expandability, and I'm working with a number of artists on the next round of new chapters. I'll be adding more of my own material in coming months, including an acrylic painting tutorial and a seminar on coverup tattooing. This is something that Reinventing subscribers can expect regularly, as there are so many subjects in tattooing that we can explore in detail. You can subscribe for a special introductory price until January 15, 2016. It's available now at TattooEducation.com!